Is Commodify.us an elaborate art joke? Last week I was sent a link to commodify.us – a new web application where you can upload your data from Facebook, and choose whether to license it directly to marketers or make it available as open data. It’s a neat idea which has been explored by a number of other startups (e.g. Personal.com, YesProfile, Teckler). Looking at the ‘Browse Open Data’ part of the website, you can look at the supposedly de-identified Facebook profiles that other users have submitted. 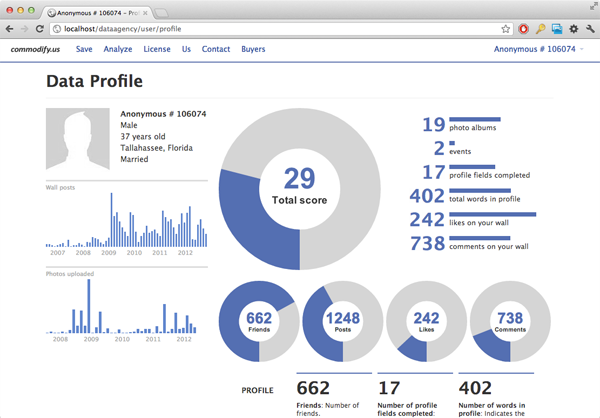 These include detailed data and metadata like number of friends, hometown, logins, etc. The problem is, despite the removal of names, the information on these profiles is almost certainly enough to re-identify the individual in the majority of cases. They’re behind a few other projects in a similar vein, such as ‘Give Me My Data‘. I remembered seeing a very amusing presentation on the Web 2.0 Suicide Machine project by Walter Langelaar a year or two ago. So I registered using a temporary dummy email addresses, to have a look around, but I didn’t get to upload my (fake) data because the data upload page says it’s currently being updated. I tried sending an email to the mailing address moderator ( listed as tim@moddr.net ) but it bounced. If this is intended as a real service, then it’s pretty awful as far as privacy is concerned. If it’s intended as a humorous art project, then that’s fine – as long as as there are no real users who have been duped into participating.